Millennium Park is an incredible place to take kids. It is home to a giant chrome "bean", called the Cloud Gate, that reflects the Chicago skyline. There is a concert stage as well. My favorite part by far is the huge twin water fountains. 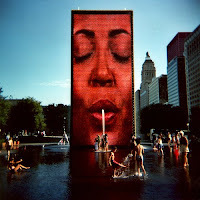 Each of the two fountains change to show Chicagoans on their three story tall displays. Every 15 minutes or so, they their lips together and a stream of water sprays out of their mouths. Parents can kick off their shoes and wade in water no deeper than a puddle with the smallest of children without getting wet above the knee in between the fountains. There is a giant pink elephant wearing glasses just off the Interstate north of Madison. If you have to get gas north of Madison, you might as well get gas next to the pink pachyderm.